Mulege is a simple town half way down Baja California, on the Sea of Cortez. The bananas and coconuts that grow along the Mulege River are used in local desserts. One straightforward recipe is just 3 ingredients, banana slices quickly fried in butter and sugar. I like the idea of adding the coconut flavor, either as coconut ice cream or a splash of coconut rum. This recipe only cooks for 1 minute so have the ingredients measured and the serving plates at hand before you set the skillet to heat. Peel the bananas, cut each in half crosswise and lengthwise. Choose a non-stick skillet large enough to hold the slices in one layer. Heat the skillet over medium and add the butter. Once the butter is melted, sprinkle in the sugar and cinnamon. Place the bananas, cut-side down in the pan and cook for 20 seconds without moving the pan. Add the juice or rum and swirl to combine (being careful of the steam). Let cook 40 seconds more swirling once or twice, until the sauce thickens slightly. 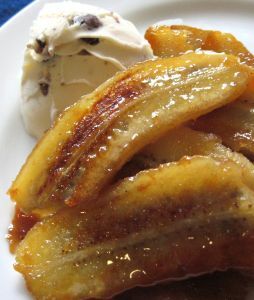 Remove bananas and sauce to individual plates, garnish with ice cream or a sprinkle of coconut rum.